The Security system in Enterprise Architect is designed to facilitate collaboration, not as a barrier to incursion. The information contained in the Repository is a valuable organizational asset that needs to be maintained and secured as such. The asset must be protected from both intentional and inadvertent compromises of content. The Security system allows update functions to be restricted to a set of users or groups with the appropriate defined permission. Packages, elements and diagrams can be locked by users, preventing others from updating them. Security has been designed to restrict access to update functions to groups and users who have been granted the access permissions to perform these functions. Packages, elements and diagrams can also be locked for change by a user under a single user ID or group user ID, preventing others from changing them. The Security system has been designed primarily to facilitate collaboration and cannot be used to restrict users from viewing parts of the model. User/group locking - (Less Rigorous Policy) the whole repository is unlocked. When a modeler edits an element or diagram the element or set of elements is automatically locked, preventing others from editing them. Any number of users and groups can be defined. 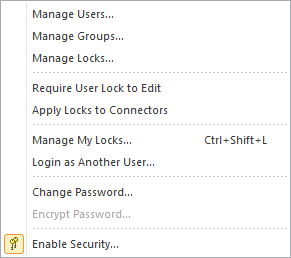 Users can be given individual permissions and also placed into one or more groups that have additional permissions defined. 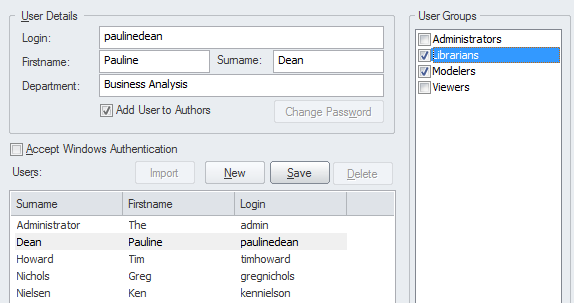 The set of permissions for a user is the sum of their individual permissions plus those of any groups they are assigned to. Users can be defined manually or imported from Windows Active Directory, allowing single sign-on using Windows Authentication.